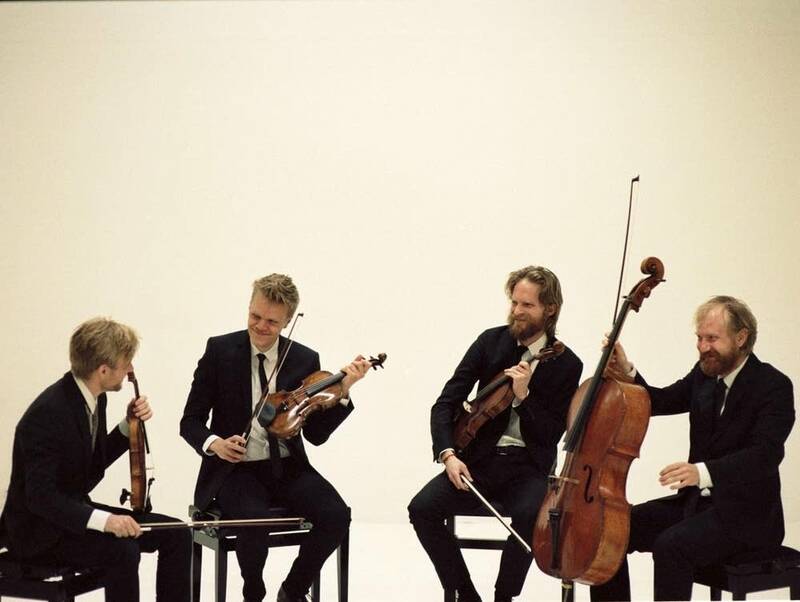 The Danish String Quartet is one of the most widely acclaimed chamber groups at the moment  although, in the interest of full disclosure, we should tell you that one member of the quartet is actually Norwegian. The group has a new record called Adès/Nørgard/Abrahamsen that features a program of Danish and British music. The composers highlighted on this release  Thomas Adès, Per Nørgard and Hans Abrahamsen  hold a special place in the story of The Danish String Quartet. Recently, two of the group's members  violist Asbjørn Nørgaard and violinist Frederik Øland  spoke with NPR's Scott Simon about how the recording, and the group itself, came together. You can hear their conversation at the audio link, or read on for an edited version. Scott Simon: The two of you, and violinist Rune Tonsgaard Sørensen, have known each other since before you were teenagers. How did that happen? Frederik Øland: Well, the three of us  Rune, Asbjørn and I  we met at this music camp in Denmark. It's only a week every summer, and you go there with people of all ages to just play music for a week  orchestra stuff, and then chamber music throughout the night. And you don't sleep a lot, that's for sure. So we were just hanging out there, playing our first chamber music together, playing soccer  even having our first beers together, later on! This was a very nice place to grow up, because it's a place that's full of love for the music. How did the composers Thomas Adès, Per Nørgard and Hans Abrahamsen wind up sharing space on your album? Asbjørn Nørgaard: Well, this is a recording that we have been talking about for a long time, but it took a while to realize. The Abrahamsen was almost the first quartet we learned, almost 15 years ago. At this point, we were quite young; we were still teenagers. We had an idea that classical music was mostly Brahms, Mozart, Haydn  kind of nice stuff. And then our chamber music teacher back then, he put in front of us this piece by Abrahamsen. We had never heard about this guy. We started to play and it sounded really crazy. It sounded more like heavy metal than classical music! We really, really enjoyed playing it, to use our instruments in a completely different way, and to experience that a string quartet can morph from something that's in a way very classical, very in-the-box, and then it can explode and morph into everything you can imagine. We always thought we would like to record that at some point. A little bit later in our development, almost the same story happened with the Adès  his first string quartet, Arcadiana. This is classical music, but [one] particular movement, called "Tango Mortale," is very rough, very rhythmical, very aggressive kind of music. It also became a part of the story of our quartet. So then we had these two pieces that we really wanted to match on the recording. What's the classical music audience like these days? Nørgaard: That's a very complicated question. And actually, I think it's  if I might say so  almost a wrong question to ask, because we just think about ourselves as musicians, not as maybe classical musicians in the old way. I think today, if you train as a classical musician, you need to sustain a great degree of flexibility. You need to be able to be in a bar and perform and not be awkward. And in our experience, we do our own festival in Copenhagen, and we've built an audience here which is quite young, actually. So we don't share this kind of pessimism about the classical music audience that's "dying away," that you sometimes read about in the media. Do you have a favorite composition on this release that you'd like to point us to? Nørgaard: If there's one track on this album that will have a popular appeal, it's a specific movement of the Adès quartet [called "O Albion"]. A friend of mine said he thinks this sounds like Coldplay. It's a very beautiful slow movement, and it's just an example that classical music is many things: It can be aggressive, it can be beautiful, it can be simple, it can sound like it was written 500 years ago, and it could sound like it is being improvised in the moment. And that's the joy we have as a string quartet, and I think this album represented well. It can sound like Coldplay, it can sound like heavy metal and it can definitely also sound like classical music as you think it should sound.